Elizabeth Kolbert‘s first book, The Prophet of Love and Other Tales of Power and Deceit (Bloomsbury, 2004), profiles a range of New Yorkers from politicians to policemen to bureaucrats. For her second book, Field Notes from a Catastrophe: Man, Nature and Climate Change (Bloomsbury, 2006), Kolbert traveled from Alaska to Greenland, and visited top scientists, to get to the heart of the debate over global warming. Growing out of a groundbreaking three-part series in The New Yorker, her book brings the environment into the consciousness of the American people and asks what, if anything, can be done, and how we can save our planet. 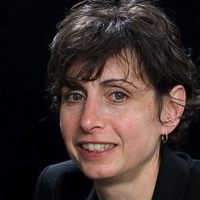 Kolbert has been a staff writer for The New Yorker since 1999 and has written dozens of pieces for the magazine, including profiles of Senator Hillary Clinton, Mayor Michael Bloomberg, and former Mayor Rudolph Giuliani. Her stories have also appeared in The New York Times Magazine, Vogue, and Mother Jones, and have been anthologized in The Best American Science and Nature Writing and The Best American Political Writing. She is a graduate of Yale University. In 2006, she was awarded a Lannan Literary Fellowship.